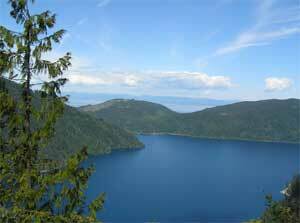 The Lake Crescent visitor center is a great place to get a taste of the North Olympics. It is a sort of Disneyworld approach to the peninsula offering small tastes of a variety of attractions. Not only is there Lake Crescent Land featuring this blue jewel of a lake, for swimming, fishing or boating, but there is also Waterfall Land starring Marymere Falls, River Land, starring Barnes Creek, Nature Land, with a variety of nature trails, and Mountain Land, starring the strenuous Mount Storm King ascent. 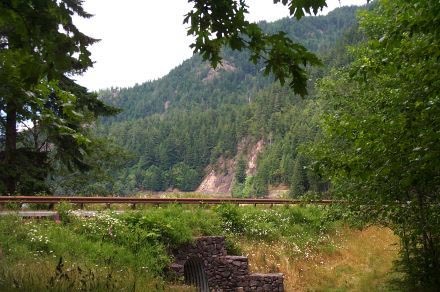 This latter attraction offers a vigorous climb up Mount Storm King for a totally spectacular view of Lake Crescent and the Strait of San Juan de Fuca. 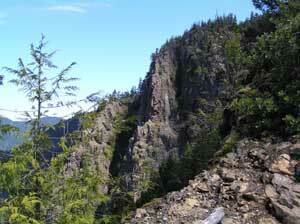 Take route 101 west from Port Angeles, past the Elwha turn off, past Lake Sutherland, on until you see Lake Crescent. It is hard to miss. Keep going another 3 or 4 miles to the visitor center on your right. Welcome to Waterfall Land. This "country" needs no further introduction. We all know what to expect in Waterfall Land and we get it. This is an easy trail with a pleasant climb to see a beautiful waterfall in a rocky grotto full of greenery. It is a good rainy day hike, and a good one to take with smaller children. From the parking lot, head back towards the road and take the tunnel under it. Then, just follow the trail. There are big, old spruce trees, ferns, moss and other neat stuff along the way. You will pass the trailhead for the Barnes Creek Trail and the Storm King climb. Take the former if you want to explore more, take the later if you want a real challenge. Before the falls, there is a sandy river beach, which is a perfect place for children to go exploring. It has an air of adventure, with its sandbars and rapids, without actually being very dangerous. (Not very dangerous is not the same as not dangerous at all. Human children are very clever at finding danger). 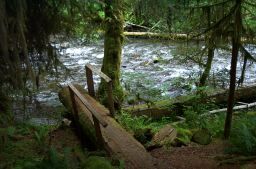 You cross two wooden bridges, with handrails, sort of like at the Disneyworld hotel and climb up to the falls. There are two routes. We find the "easy route" harder than the "difficult route", but then, we are difficult people. 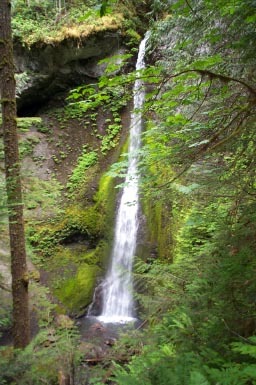 The waterfall plummets a rocky grotto, surrounded by the wild rainforest vegetation. There are mysterious caverns, that you cannot explore, and a comfortable viewing platform, so you and the little ones can rest after the climb. Lake Crescent itself is simply beautiful. The parking lot, visitor center and lodge are all located on a peninsula on the lake and you can walk along the lake shore and enjoy the views. Pyramid Peak is the high mountain straight across from you, but this is more an opportunity to stroll, perhaps wade, or fish. Just walk from your car to the lake, pick a direction and stroll. That's Lake Land. If you in a more intellectual frame of mind and wand something for the mind, as well as for the body and soul, take one or more of the nature trails that run through the peninsula jutting out into the lake. These have explanatory signs, describing the wildlife, the plants, the geology and their relationships. The trails go through the flat forests on the peninsula, and wander about nicely. You can easily combine the nature trails with a lake walk and come away educated and enlightened. Barnes Creek is the star of River Land and the trail starts along the main route to Marymere Falls. Unlike the falls trail, which is broad and flat, a turn down the Barnes Creek trail leads to adventure. The trail follows the river valley, wandering up and down with great views of the creek and its rapids. The river is full of fallen trees, so there is lots of water action. The going is relatively easy, but their is some climbing, and here and there, the going gets rough with slippery rocks and wild vegetation. If you want, you can climb out towards the river a bit and settle down and watch the water flow. It is wilder in the late spring, in June, but puts on a good show most of the year. Hearty River Land adventurers will make their way to the end of the trail, perhaps a mile and half from the trailhead, where the wooden bridge was washed into the river. beyond this point, only true adventurers will travel. The rest of us will make our way back the trail. This land is only for the stout of heart, as the trail is steep enough to induce heart failure in anyone inclined to such maladies. The trail starts out steeply and stays steep, with little respite. The overall ascent is 1750' from the junction with the Marymere Falls trail. The trail passes through forest, with many switchbacks and rocky, rooty stretches. Eventually, you reach an overlook of the Barnes Creek valley, at perhaps 800' up, but the real views don't start until over 1300', where you find yourself in alpine country, full of krumholz, on a rocky ledge overlooking the lake. 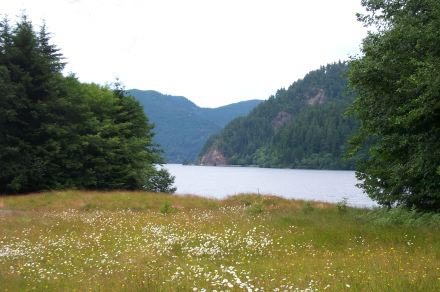 The view is spectacular, with Lake Crescent at your feet, then more mountains, then the Strait of San Juan de Fuca, and then Vancouver Island beyond. You can stop here, or you can go on another 400' up to the end of the Mountain Land trail. This is a bit of a scramble. The trail seems to be made, rather poorly, of broken rock, but there is a great view. The crazed adventurer type trail continues beyond the sign warning you to turn back before it is too late. Given that there is not much of a trail here, we have never made the full ascent of Storm King and, to be honest, we have no regrets. This local summit is enough Mountain Land for us. It is a good idea to bring water on this trail, and we recommend hiking sticks. The first time we took it, we hit an alpine meadow of broken rock and slippery soil, we nearly gave up. UPDATE - May 2004 - We were just up to the overlook (1420'), and trail is in great shape. There were a few trees down this winter, but the park service seems to have cleaned everything up. Do not take the Mount Storm King trail unless you are in good shape, and then, bring a hiking stick or two and some water. This is a serious climb. Do not use margarine instead of butter if you do decide to make krumholz. You can see Canada in the distance.